If you have read the book Sweethearts you know that the “beans and bacon” scene was of personal significance to Jeanette MacDonald and Nelson Eddy. And that they returned to Lake Tahoe for periodic “anniversaries” and even if they couldn’t return, they occasionally had a ceremonial meal of beans and bacon as a reminder of happy times. Add the rest of can of beans. now repeat the entire process over again, using as many as three or four cans of beans, according to the amount desired. When pot is filled, spread strips of bacon across the top, and sprinkle with brown sugar. If you do not like your beans sweet, use less maple sugar and brown sugar. Also, if you like them less liquid, squeeze out some of the tomato juice before adding to the overall mixture. Place in hot oven for about 1 1/2-2 hours. Serve with hot Boston Brown Bread. 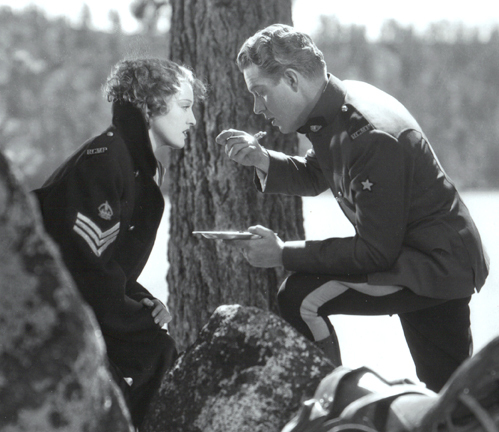 « Pinterest: Join us on the new Jeanette MacDonald & Nelson Eddy board! » Own a Nelson Eddy costume from “Sweethearts”! Sharon, #6 is lovely, but #5 is still my favorite. They look so blissfully in love with each other from head to toe!